The Better Block project started in April 2010, when a group of community organizers, neighbors, and property owners gathered together to revitalize a single commercial block in an underused neighborhood corridor. The area was filled with vacant properties, wide streets, and few amenities for people who lived within walking distance. The group brought together all the resources from the community and converted the block into a walkable, bikeable neighborhood destination for people of all ages complete with bike lanes, cafe seating, trees, plants, pop-up businesses, and lighting. The project was developed to show the city how the block could be revived to improve area safety, health, and economics if ordinances that restricted small business and multi-modal infrastructure were removed. Since that time, Better Block projects have been developed throughout the world with many of the temporary infrastructure improvements and businesses made permanent. The Better Block is an open-sourced project that is free to re-use and build upon, though we ask that individuals and organizations that use our work credit us under our Creative Commons License. This site is developed to provide help for communities that wish to build their own Better Blocks complete with news, tools, and other resources they may need to help rapidly revitalize neighborhoods. Our consulting firm, Team Better Block, assists cities with planning, designing, and measuring the impacts of Better Block as an alternative to the typical urban planning process. We have a variety of services that will elevate the success of your project. For more information on consulting, email info@teambetterblock.com. We’ve found it’s best to address the following four areas when developing a Better Block, which we will break down in greater depth below. Does it feel safe to cross the street? Does it feel safe to stand on the sidewalk? Does it feel safe to linger in the area? Does the area have hidden corners or large obstacles that reduce open sightlines? Is the area filled with debris, graffiti, overgrown landscaping, etc.? Do the businesses have bars on the windows or opaque windows? Our goal is to address each of these questions and find ways to improve the area rapidly. Do pedestrians have easy and clear access to the area? Do bicycles feel welcome in the area? Is the area easily accessible from neighborhoods? Are there way-finding signs that direct people into and out of the area? Are there amenities that allow people to linger in the space (seating, tables, etc.)? Are there food options on the block? Are there places to eat outdoors? Are there maps, bulletin boards, games, or other amenities that encourage people to linger? Is the identity of the area prominent (arts district, cultural district, historic area)? 8-80, Dog-Owners. Lastly, we look at amenities that create invitations for everyone—from babies to 8-year-olds to 80-year-olds, and beyond. These groups tend to be indicators of a healthy environment that feels welcoming and attracts other people. Preview the area for best possible Better Block locations. We’ve created a quick survey that helps us identify strong candidates. Ideally, locations with a block of buildings that have good pedestrian form, but lack a complete street are preferred, but we’ve developed Better Block projects in areas that failed to meet much of the criteria identified in the survey. It’s still possible, but the project will only be as successful as the community you partner with. Typically, areas built pre-war have good possibilities. Also, review former streetcar intersections at your local library to help identify small commercial corridors that are nestled into neighborhoods. Proximity to a neighborhood is the most important factor when putting together a Better Block. Create a free wordpress.com or blogspot.com site to provide the community information on the project. Also, create a facebook event so others can like the project and begin forwarding details to your contacts within the community. Post your event on the Better Block Group Map. We’ve setup a collaborative map for anyone interested in developing a Better Block project here. Pin the block you want to repair and be sure to provide links so others can take part. Assemble a team of grassroots community activists, nonprofit groups, businesses, artists, and DIY’ers. College students, urban planning/architect associations, young business professionals, and local Etsy groups have been some of our strongest partners for Better Block projects. Latch the Better Block to an existing event, such as an art crawl, ciclovia, fun run, etc. More than likely, the area you’re revitalizing has been offline and most residents don’t know to return to the area. We’ve developed food events, bike rides, and more that celebrate a community’s identity while aligning the effort with a Better Block area. Work with your city to permit the project using either a block party permit or assembly permit. Start this process at least 60 days prior to your date. Work with area property owners to allow access to vacant spaces for a weekend. In the past, we pitched events as giant “art installations,” so the vacant spaces become defacto art galleries. Our property owners were excited to freely allow access because we were actively marketing their properties. Also, immediately following our original Better Block, several of these vacant spaces were leased. Create groups to develop and install temporary “pop-up” businesses to show the potential for what could be if the street had a more inviting presence. Also, try and keep in mind all users (young, old, etc.). We installed a cafe with outdoor seating to highlight the ability to re-utilize the space given to cars. We also created a kids’ art studio so families could be involved, and a flower/gift market filled with local craft goods. You could also do a book-drive collection, and create your own small bookstore as well with what is collected. You don’t have to get overly elaborate with your product offerings. For cafes, coffee out of a pump urn is simple, inexpensive, and can create an inviting experience. If possible, work with existing local businesses to help fill the storefront with product. The goal should be to place as many local products as possible in each of the shops. Include as many people-friendly aesthetics. We’ve worked with local props warehouses to bring in planters and temporary street lighting to help divide the street. You can also build your own planters and sandwich boards from old pallets. We’ve strung simple bailing wire between buildings at 15′ high (above a semi-truck’s lowest clearance), and attached recycled holiday lights to help provide more ambiance. Calm the street with bike lanes. Work with your city to test the viability of bike lanes, cycle tracks, dedicated transit lanes, or expanded sidewalks. White duct tape works extremely well as a replacement for paint. Also, we’ve mixed our own removable paint using equal parts flour, corn starch, and water which quickly dissolves at the end of the project. Spray chalk or tempera paint is also an alternative. Invite artists to perform in the street. Music is a key component to having an exciting street. Use a guitar amplifier and play tracks from an iPod or invite DJs or drum circles to bring a soundscape to the block. – Remember that people want a reason to stay and be apart of the environment. Be sure to provide plenty of seating, things to read (maps, build simple kiosks to use as community boards, food/drink). Chess boards, et cetera. Print out and post the story of the block (its history, its present, its future as a neighborhood place). – Promote throughout the neighborhood, city, and more. Send fliers to local universities, schools, and more. – You’ll more than likely need a permit to close a portion of the street. We specifically asked to allow one lane of vehicle traffic so that residents could see that a “complete street” that allowed all modes of transit was a viable solution. Had we simply blocked off the entire street, the message would not have been conveyed as well. – Insurance. Oftentimes, property owners will ask for insurance before allowing access to their buildings. We take out simple “Block Party event” insurance policies and add property owners as “additional insured” for our projects. – Invite your Mayor, council members, and city staff so they can see the possibilities for themselves. Be sure to track sales to show the increase in area business (potential for increased tax revenue is a city’s largest motivator for change), and spotlight how traffic slows but people still have easy access and come out. We will be releasing a handful of tools shortly to help with analytics for your project. Check back soon! – Lastly, have fun! Remember that if you want creativity, take away a zero from your budget. Oftentimes groups get stifled by the lack of funds, but since the project is a demonstration, you can often borrow the majority of the items needed for the project. If funds are definitely required, use indiegogo.com to setup a crowdfund to help with the effort. View the following video of our first Better Block project. All information contained herein should be independently verified and confirmed based on local laws and ordinances. Team Better Block does not accept any liability for any loss or damage whatsoever caused in reliance upon such information. Readers are advised that the material contained herein should be used solely for informational purposes. I love the ideas. Is anyone already addressing a site near the corner of Park & Wolfe Street? The Brick is great…and maybe we can continue to expand the “Better Block Project”. Thanks. This is wonderful! I read about you in this months Natural Home magazine. We did many of the same things here in Helena, MT, including turning an old outdoor space into an open air movie theater, placing adirondack chairs on little “pocket parks” every day, and so much more. Way to go! Keep up the good work. We love hearing about people with this kind of energy. I was lucky to find your betterblock.org blog. I don’t have much to add to the conversation, but I’m right there with you. This post said exactly what I have been thinking. Good to see you posting again. This is just so awesome. I love, love, love this. So many more people and cities need to see what you have done and make it happen to create the opprotunity for change! AMAZING! I found out about The Better Block Project on NPR. 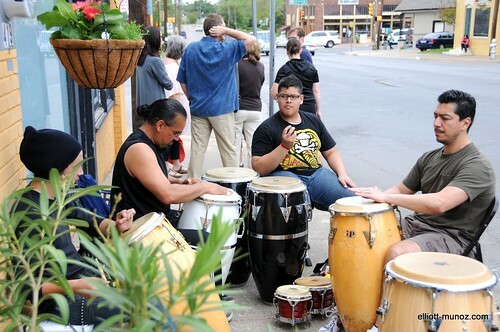 Its a great way to bring back life and culture back to neighborhoods, especially during difficult times. I hope the Better Block Project reaches Chicago, as well as all big cities, smaller medium size cities and other communities. This is a terrific idea. I am a community organizer in Kansas City and just knowing that there are folks in other parts of the country with the same thoughts and ideas is amazing and encouraging. You set a great example for the rest of us. I can’t wait to try this in my own community. Had our first Build Day today for Better Block Bluebonnet Circle in Fort Worth Texas. Great fun building tables and chairs out of pallet wood for our event to be held on 9/21/13. Volunteers so fired up we scheduled an additional Build Day. The NEW New Ken A Better Block Project was a success!